Philips electric shavers are the best rotary head shavers available. Usually made in Holland, they offer the rotary head cutting system with lift and cut technology that shaves the whisker below skin level. They are usually designed for world-wide use and accept 100-240 volts. We carry a full selection of Philips Philishave razors. Philips, Braun and Panasonic top of the line razors have lithium-ion batteries that do not develop a memory. 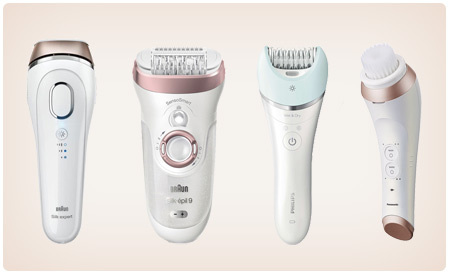 Philips Canada has a strong lineup of lady shavers and epilators. All Philips hair removal products for men and women come with a 45 day money-back guarantee directly from the manufacturer. Braun shavers are the best selling foil shavers world-wide. They are usually dry-only shavers, but in 2012 they are also offering wet-dry models, that can be used in the shower and are 100% waterproof. Braun was the first shaver manufacturer to offer self-cleaning shavers. Most other shaver companies now offer a similar feature on their premium shavers. Most of Braun's high end shavers are still made in Germany. Braun introduced the brand new Series 9 shavers in 2016. These shavers feature a 4-blade shaving head. Braun 2 in 1 ladyshavers - epilators are ideal for travel since they operate on world-wide universal voltage. Epilators are available as cord-cordless rechargeable or cord-only models. Mercury Shaver Centre is the exclusive service provider for Braun / Oral-B products in Canada. Panasonic razors provide a full line of wet-dry shavers ranging from the basic entry level razor to the high end models with a 14,000 cpm linear motor, the fastest motor on the market. All Panasonic shavers are completely waterproof and can be used dry or in the shower. These shavers are usually preferred by customers who have sensitive skin and would prefer to shave using shaving cream or in the shower. Most high-end models are made in Japan. 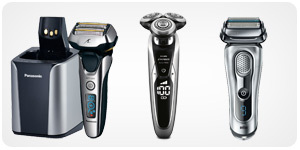 Panasonic offers a 2 year exchange warranty for all men's and women's grooming products. Remington makes mostly inexpensive rotary and foil shavers for the budget-minded customer. These shavers perform well, but cannot be repaired since only the replacement foils and cutters are available. They would be a good choice for someone purchasing their first shaver. Remington makes very popular lady shavers and bikini trimmers that are inexpensive and perform well.